-You want maximum lift and stability for SUP surfing success. 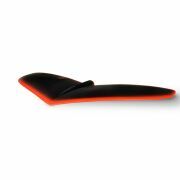 Included with our FSUP package, this is our largest wing, and you?ll appreciate the extra surface area when you?re gliding across the water on barely a ripple and pumping in circles to catch wave after wave. -You?re a SUP surfer or just looking to pump across the Ocean. This wing can pump for days even on flat water and holds large amounts of weight like SUP boards / heavier riders. -You're a windsurfer that wants the ultimate go-slow pump foil wing. This wing is for the wind foiler that wants to be able to do carving tricks, foil out with ease and ride the tiniest bumps while luffing the sail.